The engaging programme, the company of like-minded people, and unique items created unforgettable memories and experiences at the Finnish Craft and Design fair. The event opened with awarding of virtuosos of crafts and design, ranging from the Taito-Finlandia winner to the Artesan of the Year. The D Hall showcased the miniature worlds of the Doll’s House Fair and the Railway Modelling Event. The combined number of exhibitors in these events was 750, with a record number of 49,331 visitors. This is 4,921 more than last year. The next craft and design fair will be held in Tampere on 16–18 November 2018, with the theme of crafts and design skills of children and the young. The event has grown considerably, and changes are on the horizon for the arrangements of the fair next year. The largest crafts and design fair in Europe again supported Finnish small enterprises and brought together a record number of like-minded people to enjoy the weekend of light and joy at the Tampere Exhibition and Sports Centre. The fair organiser will respond to the growing number of visitors by implementing changes. “The Finnish Craft and Design fair is the number one event in Finland, and it shows. For a long time, our goal has been to implement changes to make the 2018 event smoother for visitors. On Friday, we already announced changes to next year’s layout to the exhibitors. With the layout and other changes, our aim is to ensure that a visit to the fair would be a good and pleasant experience. As the event organiser, we want to make the fair a success for both visitors and exhibitors,” says Jasmin Saadetdin-Rikkinen , the event Project Manager at Tampereen Messut Oy. The themes of next year’s fair will also focus on the future, children, young and communities. Next year, the Finnish Craft and Design fair and 4H in Finland, celebrating its 90th anniversary, will jointly promote crafts as a hobby by organising a national crafts and design contest for children and the young. “We selected crafts as the theme of the anniversary year’s crafts and design contest. The contestants may crochet, knit, sew, felt or even whittle from a piece of wood imaginative feed for hobby horses. The hobby horse activities, which have become very popular in 4H, have been an excellent motivator for children to make things with their hands,” says Marjaana Liukko, Director of Youth Work at 4H in Finland. 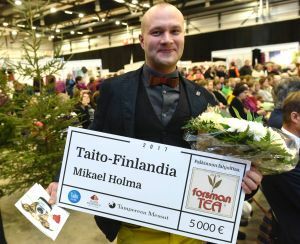 Restaurointi Mikael Holma, of Hämeenlinna, received the Taito-Finlandia 2017 awards at the opening ceremony of the Finnish Craft and Design 2015 fair on Friday, 17 November. The award of 5,000 euros was donated by the Finnish tea producer Forsman Tee, and the winner was selected by Finlayson Oy’s CEO Jukka Kurttila. 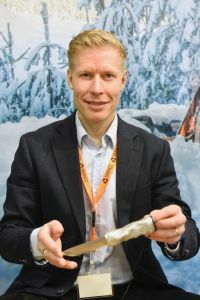 According to the selection jury, the 3D knife handles crafted by Antti Korpi, based in Tampere, who won the Artesan of the Year award, skillfully utilise 3D technology, which is relatively new in the industry. The Finnish Craft & Design Fair is the largest handicrafts and applied arts fair in Europe with almost 700 exhibitors and over 40,000 visitors every year. The Finnish Craft & Design Fair is organised by Tampere Trade Fairs and Taito Pirkanmaa. Tampere Trade Fairs is responsible for organising the Dolls’ House Fair together with the Finnish Doll’s House Association and the Railway Modelling Event together with Pirake (Pirkanmaa Railway Enthusiasts’ Club). Read the press release from November 20 2017. Tampere Trade Fairs Ltd is the second largest trade fair company in Finland, that organises dozens of high quality exhibitions for both professionals and consumers in Tampere every year.